What’s bad and—surprise—what’s good about noise, explicated by fuzzy-logic/neural-network doyen Kosko (Fuzzy Thinking, 1993; The Fuzzy Future, 1999). He begins with the bad: Noise as damager to hearing, trigger of stress and causer of birds and whales to change their tunes. He even provides chapter and verse on the laws governing public nuisance and trespass and proposes that cities generate noise maps in steps toward prevention. Then comes an exegesis on information theory, launched by Claude Shannon’s 1948 paper describing communication as the transmission of a signal, with the goal that the receiver gets the identical signal the sender sent. Shannon’s insight was to change analog signals, such as smoothly varying waves, into smoothly varying probabilities that the receiver gets the binary bit of a 1 versus a 0. So began the digital revolution, which challenged scientists to find better ways to preserve the integrity of the signal. To explain the various engineering feats used to improve signal-to-noise ratios, Kosko begins with the abstract: the concept of “white” noise, composed of all sound frequencies of the same magnitude. But since that would represent an infinite rage of frequencies requiring infinite energy to achieve, it is an ideal. Instead, variations of “colored” noise can be modeled, associated with probability curves. Examples include the leftover thermal noise of the Big Bang and the Brownian motion of molecules. 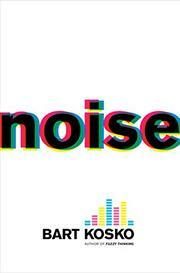 Engineers get around unwanted noise by developing selective noise filters and using signal sampling methods. The kicker is that Kosko explains how injecting noise (within certain parameters) can actually improve some signal transmissions. Along the way, he tells the story of how Hedy Lamarr and composer George Antheil patented a method for coding signals using frequency “hopping” (perhaps because teenager Lamarr absorbed much from conversations her first husband had with Nazi officers). All this discourse builds into a last chapter on “stochastic resonance,” which the author defines as a noise benefit in nonlinear systems. At the nano scale, SR might have launched life, he suggests, via the Brownian motion of molecules driving molecular motors in primal cells. Heady reading from a polymath popularizer, but exhilarating nonetheless.